Volcanoes, waterfalls, and canopy tours! Trekking through the Costa Rican Rainforest, it’s easy to understand why the rainforest needs to be preserved: it’s a place like no other. Just north of the equator, Costa Rica not only boasts a tropical climate year round but also has many microclimates that allow for a variety of species and plants to thrive. The seasons are even held to different standards: they are not defined by the temperature but by rainfall. The wet season or “winter” runs from May to November. During these months it rains nearly every day and coincides with hurricane season. The dry season or “summer” to the locals is from December to April and is marked by very pleasant weather and much less humidity. Owing to the tropical climate and frequent rainfall, the soil in Costa Rica has always proven to be fertile and rich, making farming the traditional way of life for many Costa Ricans throughout the years. However, the rapid deforestation of the 1970s and 1980s has made a farming lifestyle difficult for both the farmer and the land to sustain. In an effort to prevent deforestation, the Costa Rican government has placed much of the rainforest under its protection. People are no longer allowed to farm or clear land in state protected areas. The people of the small village El Sur de Turrubares, adjacent to the Carara National Park, experienced firsthand the hardships of losing the prosperous farm land they had relied upon, when they lost the right to farm in 1990. Many families left the area in an effort to find work, but the people who stayed did so for the love of a community they had built and wanted to preserve. Without their lands to farm, they have had to seek out other avenues of livelihood, such as Ecotourism, which creates a commercially viable and sustainable use for the protected forests. The Ticans who have spent generations farming the land, now practice stewardship over the remaining forests. Globe Aware works with the locals of the village El Sur to promote a sustainable forest lifestyle as well as spread knowledge and love of the land. They have come to understand that the unique flora and fauna as well as their tight knit community would lend itself well to an ecotourism project. Visitors to this beautiful village not only get the benefit of experiencing many species up close and personal, but also the beauty of people closely tied to their land and the mutually beneficial relationship they have with that land. Globe Aware volunteers work on a variety of community projects and have helped to implement a recycling system, building greenhouses and tree nurseries. Costa Rica which translates to “rich coast” lives up to its name both culturally and topographically. The people are warm and welcoming, they know that their lives are enriched by their environment and thus embrace it whole heartedly. Cultural activities may include visiting one of 7 active volcanoes, splashing in breathtaking waterfalls, or zipping through the tree line on a canopy tour. Costa Rica is finishing up “winter” and headed into the dry season. This makes December the perfect time to use those vacation days to soak up some much needed vitamin D in an exciting locale. Visit Costa Rica for a life-renewing experience - CLICK HERE! I consider myself a life-long learner and the world is my teacher as I take a break from the classroom during the summer. 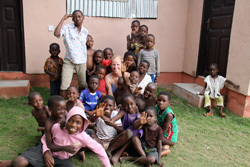 Winning the “Travel for Good Grant” through Travelocity this year helped me to get to Ghana to volunteer with Globe Aware. Now I’m in love again. With a whole village. I can’t wait to return to Mafi Tsati, a rural village outside of Ho, Ghana, approximately 4 hours from Accra (Ghana’s capital)—and I hope to return soon. My mission now is to do several things: 1) to raise money for a new school, 2) to raise money to buy Maxwell, the teacher I connected with in Mafi Tsati, a laptop with internet access, and 3) to return to finish a photo project I started, and hopefully publish a book about the women in the village. It’s been 16 years since I started teaching, and though I grow more passionate about my profession each year, I also want to continue my global connection—merging teaching and learning with travel. Perhaps as I find ways to return to Africa to be involved in improving lives there, I can bring other teachers—and maybe someday students—to improve our lives in return. Africa has changed my life in ways She will never know, and we—in our hectic, often myopic, western culture—have a great deal to learn from the amazing people in Africa. 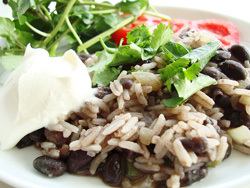 There is no more common staple in Costa Rica than “Gallo Pinto,” which is essentially black beans and rice seasoned and cooked together. It’s the most common breakfast item, but often eaten throughout the day. Many a Tica mama cooks a delicious batch of gallo pint big enough to be included in meals for the whole week. There is no formal recipe, as every Tico or Tica has their own version, so feel free to experiment. Step One: If beans are dried, cover with water and soak overnight, if they are fresh, just rise them off. Drain the beans and add fresh water to an inch (2.5-cm) above the top of the beans, salt, and bring to a boil. Cover the pan and reduce heat to very low simmer until beans are soft (~3 hours). Step Two: Chop cilantro, onion, and sweet pepper very fine. Step Three: Add 1 Tablespoon oil to a large pan and sauté the dry rice for 2 minutes over medium high flame then add half of the chopped onion, sweet pepper and cilantro and sauté another 2 minutes. Add water or chicken broth, bring to a boil, cover and reduce heat to simmer until rice is tender (20-35 minutes). This is also the recipe for Tico rice used in other favorites like tamales. Step Four: Once the rice and beans are cooked you can refrigerate or freeze them. Keep a significant amount of the “black water” with the beans (½-1 cup 120-240 ml). This is what gives the rice its color and some of its flavor. Sauté the rice, beans reserved chopped onion, sweet pepper and cilantro together in vegetable oil for a few minutes. Sprinkle with a little fresh chopped cilantro just before serving. Step Five: Once the rice and beans are cooked you can also refrigerate or freeze them. Make up small batches of Gallo Pinto when you want it by simply sautéing them together. Step Six: In Guanacaste they sometimes use small very hot red peppers instead of or in addition to the sweet. Some people add a tablespoon or so of the ubiquitous tico salsa: Lizano or Chilera to the beans while they're cooking. Our friend Mercedes always simmered the beans very slowly all-day and preheated the water or chicken broth for the rice.